The Thor Palazzo is a beautiful 36’ diesel RV that combines affordability with luxury. Stainless steel appliances, a bath and a half and plenty of outside storage are just a few of the highlights. This is a great RV for tailgating, entertaining or a family road trip. 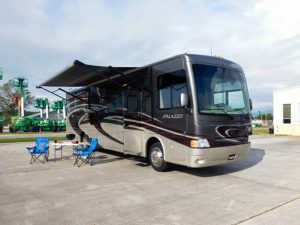 The spacious interior features a queen size bed in the master, double air mattress pull out couch, a drop down bed over the driver plus an oversized dining table that converts to a bed. Outside TV and automatic awning make it versatile both inside and out. Satellite is available along with other amenities such as bedding, camping chairs, bike rack, kitchen kits and more. Signature ___________________________________________________________________________ Date __________________________ The renter is responsible for returning the vehicle in the same condition as when departed. An in-person Equipment Review & Orientation will be provided to familiarize you with Vehicle operations. This orientation usually takes about an hour. All Vehicles are equipped with dining, sleeping accommodations, cabinets, closets, stored fresh water, kitchen, bathroom, sinks, shower, flush toilets, water and waste holding tanks, generator, range, refrigerator, furnace, air conditioner, power steering, automatic transmissions, AM/ FM stereo. Some units may be equipped with Television, DVD/Blu-Ray, Satellite and other amenities. Suncoast does not guarantee your ability to receive a signal at your destination. Insurance is required on all rentals. Suncoast will arrange for this protection on your behalf through MBA Insurance, a specialized RV rental insurer. Insurance ranges from $21-$35/day. You have a CHOICE to provide coverage through your personal carrier by providing a “Binder” acceptable to Suncoast and its insurance carrier. Coverage must be provided 7 days prior to departure. A collision damage waiver also is available to reduce your damage deductible exposure. Departures are by appointment on weekdays between 9:00 AM and 12:00 PM. Off-hour arrangements can be made at an additional cost. Returns are due back by 12 Noon by scheduled return date. Returns after 12 Noon will be charged $50 per hour up until 2 p.m. Returns after 2 p.m. but before 5 p.m. will be charged an additional 1/2 day rental while returns after 5 p.m. will be charged an additional full day. Late fees for scheduled pick-up and drop-off appointments start after 45 minutes and are $50.00/hr thereafter. If you are going to be late for your scheduled pick-up or drop-off, see late fees above and call us as soon as you know and we will make every reasonable effort to accommodate you. Clients departing or returning on time will be given first priority. If you return early, please note that Suncoast does not issue refunds for unused “rental days”. Suncoast allows up to 14 days for post check-in processing. Upon your return an in-depth inspection will be performed, followed by a more detailed inspection within 3 days, to determine if any damage occurred during the rental period. Start-Up Kit is included on all rentals at a cost of $140. And includes: up to 1 hour orientation of vehicle and house-system; complimentary driving lesson, if requested. Your RV comes fully sanitized with a topped off propane tank, full fresh water reserve, gloves, septic-safe toilet tissue, holding tank treatment, sewage and water hose and electrical adapters. Free unlimited mileage and generator use.